Motorola’s Moto X smartphone is an admirable balance of style and usability. It doesn’t try to outdo Samsung, Apple and others in the race to squeeze in as many high-tech features as possible but instead aims to please with its hand-shaped curves, cool voice-activated features and touch-friendly camera. The Moto X succeeds as a sophisticated mainstream smartphone but is no speed demon. Its user-friendliness and simplicity are apparent from the start: Instead of a cluttered home screen, the Moto X offers pretty much a plain vanilla Android home screen that allows the new owner do the customizing. And that’s not surprising since Motorola Mobility is now a division of Google, the maker of Android software. To start the camera, you pick up the phone and twist your wrist twice–that’s it; the Moto X immediately switches to camera mode. To take a photo you can touch any part of the screen–there’s no need to hunt for a shutter button. The Moto X’s 10-megapixel camera uses Motorola’s ClearPixel technology, which allows each sensor to gather 75 percent more light, thus making it possible to get clear photos even in low-light situations. according to Motorola. The Moto X can be customized with numerous color combinations for its keys and shell (including an all wood case available later this year) by ordering the unit via the Moto X website, which only offers AT&T units at the moment. Since the Moto X is manufactured in Fort Worth, Texas instead of somewhere overseas, online buyers can expect to see their new phones–already initialized with their Google accounts–in four days or less, according to Motorola. 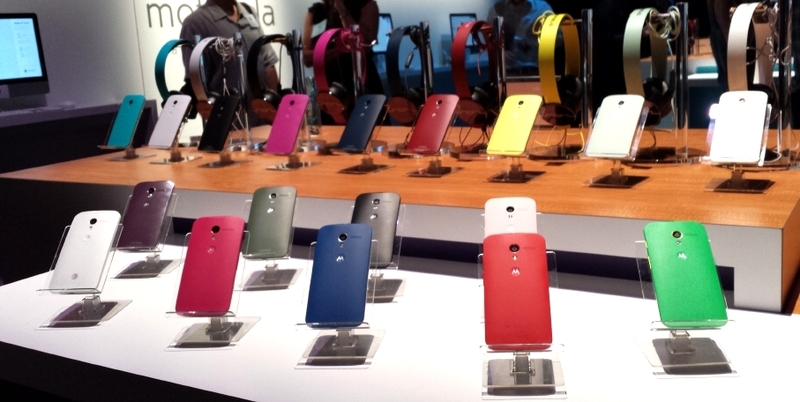 Motorola’s Moto X can be ordered in a variety of color combinations. “We think this represents a very interesting future,” said Rick Osterloh, senior vice president for product development at Motorola during a press event in New York. He said the Moto X is aimed at “the mainstream user,” not the feature-frenzied geek. Rear of Motorola Moto X. The Moto X uses what computing power it has fairly efficiently. It runs Android version 4.2.2 and has a dual-core 1.7GHz Snapdragon processor. Other top-shelf smartphones like the Samsung Galaxy S4 have quad-core processors, but they also have more sensors and higher-resolution screens, making the additional processor muscle necessary. The low-power Active Display mode on Motorola’s Moto X. The Moto X is built with what’s called the Motorola X8 computing system. It’s a set of eight processor cores assigned to different tasks. Why is this important? By using different cores for different tasks, the entire processor doesn’t have to be awake all the time–each core wakes up as it’s needed. This design extends the life of the Moto X’s 2200 mAH battery to a full day of average use, according to Motorola. Two of the processor cores are used for basic application processing (this is what makes the Moto X a “dual-core” smartphone) and four are used for graphics processing, thus speeding up video and photo functions. The other two cores take care of voice commands and sensors like the accelerometer and the ambient light sensor and help the Moto X detect how fast you’re moving and what you’re doing with the phone. When tested with voice commands, the Moto X worked very well and was able to verbally answer questions about the time, the weather, directions, baseball scores and many other queries. The quality of the speech detection is aided by the phone’s three microphones, which work together to cancel stray noises and enhance voices. A useful Active Display shows notifications in a simple, low-power mode, thus letting you know if you have incoming e-mail, text messages or other items even when the phone is in standby mode. The Moto X lists for $199 (16GB of user memory) or $249 (32GB) with a two-year plan and is sold by AT&T, Verizon, T-Mobile, Sprint and US Cellular and major retailers. This entry was posted in Android, ATT, cell phone, gadget, gadgets, headphone, headset, mobile, review, smartphone, T-Mobile, Uncategorized, Verizon Wireless, wireless and tagged android, AT&T, Bluetooth, cell phone, consumer electronics, ear bud, earbud, electronics, Google, headset, mobile, Moto X, Motorola, new york, samsung, smartphone, T-Mobile, technology, Verizon, wireless. Bookmark the permalink. ← Ten Pinterest tips from a user with 1.2 million followers: Me!